Dois quartos, um quarto com uma cama king size e um completo no outro quarto. Há um sofá-cama na sala de estar. Um banho completo com banheira e chuveiro. Lavadora e secadora configurar no banheiro também. Cozinha completa com todo o desgaste cozinhar. Microondas, forno, frigorífico, torradeira, máquina de café. Tem um antigo T. V. com um leitor de DVD com filmes. Nice área de varanda para relaxar e observação de pássaros com um carvão e propano grill. Este é um Lodge rústico que está aqui há algum tempo. Poderia ser um ótimo lugar para ficar longe de tudo e relaxar, Você terá ótimas lembranças que vão durar um tempo de vida, Se você gosta de ir pescar Luna Lake está bem ali. Você poderia simplesmente caminhar até lá. Não esqueça sua vara de pescar. Se você fizer isso, a loja Tackle é de apenas 3 quilômetros de caminho ou o Luna Lake Bait Boats e Beyond está no lago. Por favor, note que esta propriedade está na água de poço. (É seguro para tomar banho e lavar pratos) Temos beber e cozinhar água na geladeira. Você poderia trazer mais ou perguntar-me para mais água. Se você não registrar todos os hóspedes e animais de estimação, poderá ser solicitado que você os deixe sem reembolso ou cobrando R $ 200,00. 00 não reembolsável. We rented the Luna Lake Cabin for a hunting trip. The cabin was great for our purposes. It was located just outside Alpine and had a wonderful view of the lake. Everyday the Elk make their way out to the lake or to field near the house. The weather was amazing during our stay in October. We might not have had much luck with the whitetail but we had a nice stay. Cabin was everything we needed for a for day get away. First of all I'm considering getting an attorney because I fell through a rotten deck and rotted handrails and my back hasn't felt the same since. Then the owner wants to blame me for scratches on her door and the screen hanging half off when she clearly stated that the previous renters dog did the damage. Then she has the audacity to get upset when I took the tripping hazard down to prevent more damage to her cabin. She also has the nerve to complain about us not putting things in the proper area aka a coat hanger?? She assumes that we had a dog because there was dog treats left there from the previous owner. The roof had leaks, heater didn't work which she never stated during the rental process, DECK BOARDS are rotted out so the cabin is definitely unsafe and out of code, bath tub was plugged she blamed us!!! I even went out of my way to leave firewood because she didn't supply any. (I'm so glad my children weren't with me or they would have froze!!) I really hope the owner takes the deposit she took from me and puts it into getting her house up to code. If you would like to see pictures of this unsafe cabin please let me know. I wish I could screen shot so you can see that she was going to give me my deposit back but didn't. I really hope the money does this cabin well for the sake of future renters. 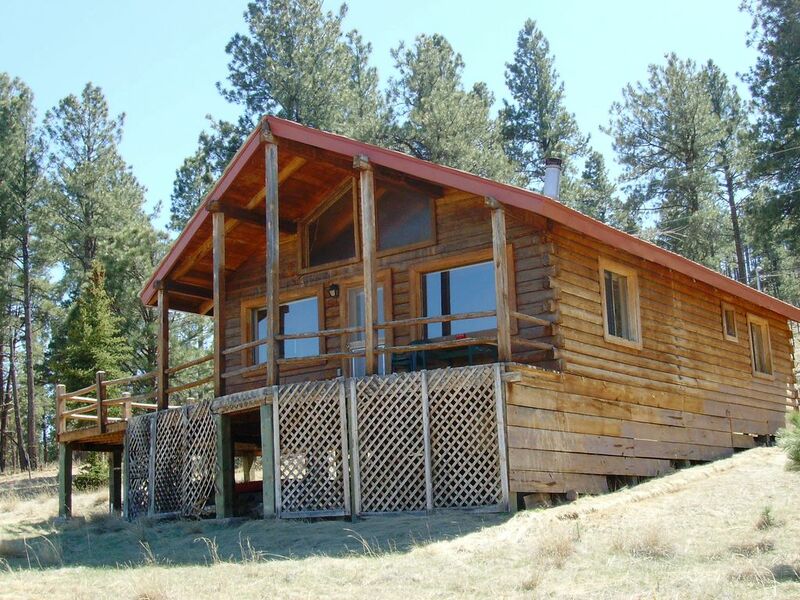 Great location with a view of Luna Lake and the surrounding mountains. Elk, eagles and other wildlife around the lake. Nice and quiet in the evenings and great for stargazing. The cabin has all you’ll need. Will be one of our go to places when we’re back in the area. We had a great stay. Saw a 50-60 herd of elk right next to the cabin. And watched bald eagles fishing in the lake from the balcony. We really enjoyed our stay. We were hoping to see some elk and we sure did. They have knocked down the property fence in the southwest corner and came right into the front yard to feed. The hummingbirds were great too. Less than a minute after I sat down on the porch for the first time one flew up a foot from my face and said hi. The thunderstorms over Escudilla were awesome. The cabin was very clean and well kept. Loved the carpet. Loved sitting on the porch. So many birds. location location location. Luna Lake Lodge tem um ar rústico e dá-lhe uma completa relaxar férias. Você está cercado de árvores e montanhas cheias de vida selvagem. A vista é de tirar o fôlego, a cabine está com vista sobre o Lago Luna. É em frente ao lago.